Model No. 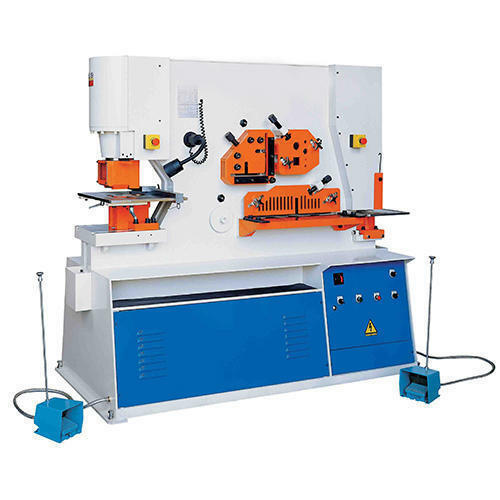 Capacity Channel / I Beam Cutting Angle Cutting Round / Square Cutting Flat Shear Punching Notching Motor H. P.
400 / 440 Volts, 3 Phase, 50 Hz Power Supply. Specifications and Photographs are for Your reference only and are subject to change without any prior Notice. Electricals Blades are not under warranty. Incorporated in the year 2011, we “Rudraksh Engineering” are leading organization engaged in manufacturing and supplying highly reliable assortment of Hydraulic Iron Worker, Hydraulic Press Brake, Mechanical Press Brake, Fixed Rake Angle Shearing Machine, Variable Rake Angle Shearing Machine, Under Crank Shearing Machine, Over Crank Shearing Machine, etc. Our offered product range is highly demanded by Transmission Tower Manufacturers, Lifts & Excavators Manufacturers, Kitchenware Manufacturers, Hardware Manufacturers, Wind Mill Manufacturers, Panel Board Manufacturers, etc. We have recently introduced ‘touch screen CNC controls’ in Press Brakes. Situated at Rajkot (Gujarat, India), we are supported by robust infrastructural base that is resourced with advanced production technology. The infrastructural base sprawls over a large area and assist our production team to manufacture products as per the global quality standards. We have divided our infrastructural base into various departments such as Procurement, Production, Quality Testing, R & D, Sales & Marketing and Warehousing & Packaging.